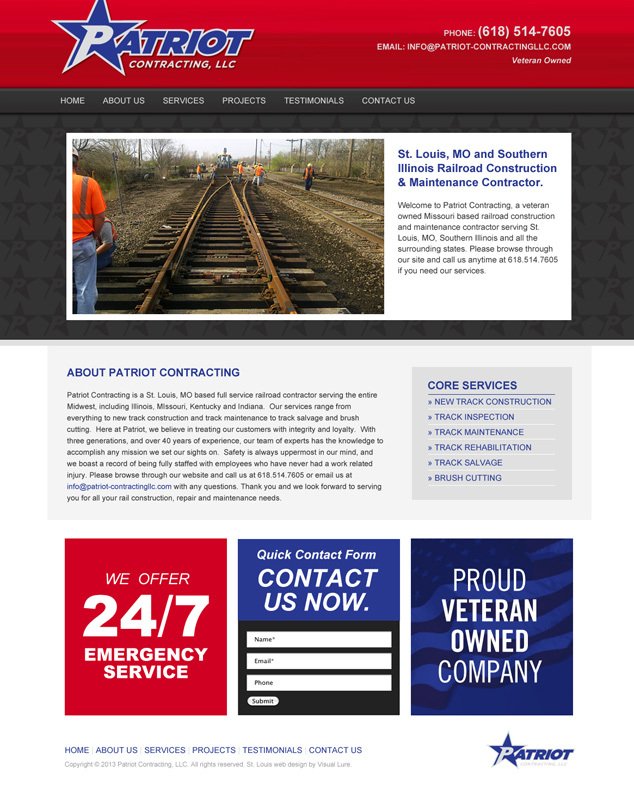 Visual Lure was recently contracted to design a new logo for Patriot Contracting, a St. Louis area veteran owned railroad construction and maintenance company. Since the company’s name is Patriot, and the owner is a veteran, eagles, stars and flags are what came to our minds. See how we incorporated these elements into the logos below. These are the initial three logo design options we provided our client. Check back soon to see which logo design the owner selects, and for a couple other sneak peeks. We were also contracted to design a new WordPress website so be on the look out for that too. LOGO DESIGN UPDATE: With a minor adjustment to the horizontal logo, our client selected the following logo design. Below the final vertical and horizontal logos is a sample of what their new logo will look like on their red trucks. WEB DESIGN UPDATE: Here is the home page design for the new WordPress website for Patriot Contracting. In addition to building the new website, we will be providing search engine optimization (SEO) services. Check back soon for the initial launch of their new website design.